Home News Campus Face off: Is pursing the NHL dream worth it? Face off: Is pursing the NHL dream worth it? Logan Caswell and Alex Ross "face off" against each other. Many boys growing up in Canada dream of becoming a great NHL hockey player but according to the book, Selling the Dream, by Jim Parcels and Ken Campbell, the odds of becoming a professional hockey player is low. Parcels and Campbell studied 30,000 players and only 39 ended up signing NHL contracts. Compared to winning the lottery, with a one in 14 million chance, these odds of 39 in 30,000 seems doable. However, when you compare and contrast whether an NHL dream is achievable, evidence shows mental and physical abilities have an impact on the outcome. Logan Caswell believes pursuing a NHL dream is worth it. However, Alex Ross does not. The debate will include a look at the tolls taken on players’ bodies and minds, the cost of the game, the growth and resiliency of players and their back-up plans. Maintaining optimum mental and physical health are two of the biggest factors in achieving an NHL dream. Constant training and pressure helps benefit players as they continue their career. According to Mike Giroux, current head coach of the AAA Minor Midget Oshawa Jr. Generals, a player with a tough mental game often makes it to the next step. “Mental health is one of the most important parts of the game right now,” says Giroux. Giroux is due to retire this season, and has coached numerous former Ontario Hockey League (OHL) players including New York Islanders’ forward Josh Bailey. AAA hockey players train five to six-days a week. Their schedules include dry land training, and practice three times a week on and off the ice. According to Giroux, the rigorous and competitive schedule is important for these athletes to making the cut with teams like the OHL’s Oshawa Generals. Despite the odds of making the cut, the rigorous mental and physical regiment required to even compete makes the journey to the NHL worth it. Some professionals are noticing the toll being too deeply involved in a sport takes on mental health. The players’ identity can be lost if they are separated from the sport. This happened with former NHL player Brian Lee, who broke down after he left the game due to a serious knee injury. It’s proof mental health is more important than any game. Dr. Wendy Stanyon, an Associate Professor at the University of Ontario Institute Technology’s Faculty of Health Sciences, has been advocating for mental health awareness and enhancing mental health literacy for most of her academic career. According to Dr. Stanyon, staying focused on reality and keeping options open is key to maintaining a healthy mind. “If you get too fixated on part of your life as being representative of who you are, then if that part doesn’t work the way you’d hoped for… then your whole image of who you are takes a heavy toll,” says Dr. Stanyon. While somebody is following their dream, they may experience opportunities just as good as their dream, and sometimes more achievable. Dr. Stanyon puts an emphasis on people keeping their options open in order not to get blinded by their own ambitions. “I always try to remind people to do what you love, engage in what you want, go after your goals, but stay open to the opportunities that might come along in life you don’t even anticipate,” says Dr. Stanyon. Players need to keep their feet on the ground and their heads out of the clouds because there are thousands of other kids trying for the same spot. Pursuing an NHL dream is worth it because it can challenge you not only physically but mentally as well. It prepares you to push your body in all situations and creates a beneficial lifestyle. Jeff Watson, the head strength and conditioning coach for Durham College and University of Ontario Institute of Technology (UOIT), has trained numerous Canadian Hockey League athletes, as well as college and university students. Watson knows coaching any of his athletes the right way can help them pursue a professional career. Watson has been involved with training athletes for over a decade and believes regardless if you make it or not, maintaining a strong training program is critical for any athlete. “Every athlete hoping to get somewhere needs a strong training regimen,” says Watson. Some might even make the NHL but even if they don’t, the training will have made the player a stronger athlete and better person. These traits will ensure success in life if not in the NHL. In certain cases, a player’s body can get pushed beyond its limit when training and playing. Former NHL player Craig Fisher knows the difficultly that comes with pushing your body for the game. 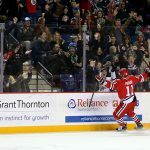 Fisher suffered a severe concussion that ended his AHL career. Although Fisher says it was just a fluke he managed to get such a severe concussion from one hit, it has still been a big influencer in his ideals. “It was just sort of a perfect storm of bad luck, it wasn’t dirty, it wasn’t anything,” says Fisher. Despite Fisher’s career, he still says that being at risk of such severe injuries makes the game not worth the risk. “Even if I was Wayne Gretzky, the greatest player on earth, it wasn’t worth it,” says Fisher. Most kids start practicing at a young age. As they get older, they train for hours a week and balance high school, part-time jobs and off and on-ice training. Jacob Traynor, a forward for the AAA Minor Midget Oshawa Jr. Generals, started skating at the age of five and works out everyday for at least an hour. Although getting drafted is still up in the air for Traynor, he knows by the end of the road he’ll be happy. Although maintaining your life off the ice can be challenging, it’ll help benefit players grow as they try and build lifestyles both on and off the ice. Forget the NHL. Many players in the minor leagues will never even see a spot on the draft list. Some parents continue to push their kids to play at the best level they can, while others show their kids alternative careers. Mark Wells is the manager of the AAA Minor Midget Oshawa Jr. Generals. Wells has two sons who play hockey and he tries to give them as many options as possible for their future. “I’m a numbers guy, so I show them the statistics, how likely you are to proceed, what level you have to be at to be there,” says Wells. Some might think telling your kids to give up on their dreams isn’t good parenting, but Wells has shown keeping your kids’ options open is important. Telling your kids to give up on their dream can keep them grounded and focused on multiple paths. “I try to give the kids that option,” says Wells. While stress is often considered bad for your health, in a 2013 TED Talk called “How to Make Stress Your Friend”, health psychologist Kelly Mcgonigal says stress is only harmful if you believe it is bad for you. Pursuing any dream can be stressful but OHL players trying to make the final jump to the NHL now have more support. 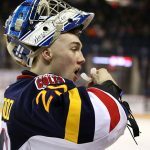 Talk Today, a Canadian Mental Health Association (CMHA) program, aims to assist all 60 major junior hockey teams in the CHL to ensure every player has access to mental health support. CMHA was started three years ago because of the death by suicide of former OHL hockey player Terry Trafford. Suicide is the second leading cause of death for Canadians between the ages of 10-24 which makes programs like Talk Today that much more important. Mireille Huneault, Media Relations specialist at CMHA Durham, has seen this program grow over the last few years and is happy about the support players have been received from it. Players are now receiving more support. Since Talk Today launched three years ago, more than 700 players have received services to better their mental state. Organizations like CMHA provide mental health and primary care services for all residents, including athletes and their families. This support is invaluable. It teaches athletes how to deal with stress and that life skill will help those athletes go far in life: potentially as far as the NHL. Alex Yuill, a former first-round-pick in the OHL draft now plays university hockey for the Ontario University Association (OUA) UOIT Ridgebacks. Yuill agress he may not make it to the NHL but that doesn’t mean he, or any player pursuing their goals to the NHL, should stop playing. 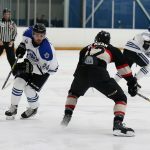 Mike Robinson, a teammate of Yuill on the Ridgebacks, also played in the OHL for two years and shares the same positive thoughts. 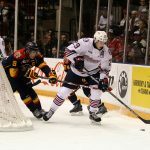 Several players like Yuill and Robinson may not make it to the NHL. However, understanding the feeling of disappointment earlier rather than later can help benefit these athletes as they grow older. For some, hockey has been a part of their entire life and thinking about not playing the game can be difficult. 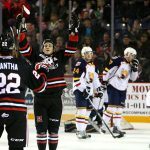 Some OHL players face the reality they won’t get into the NHL and decide to go school to begin pursuing a career outside of hockey. 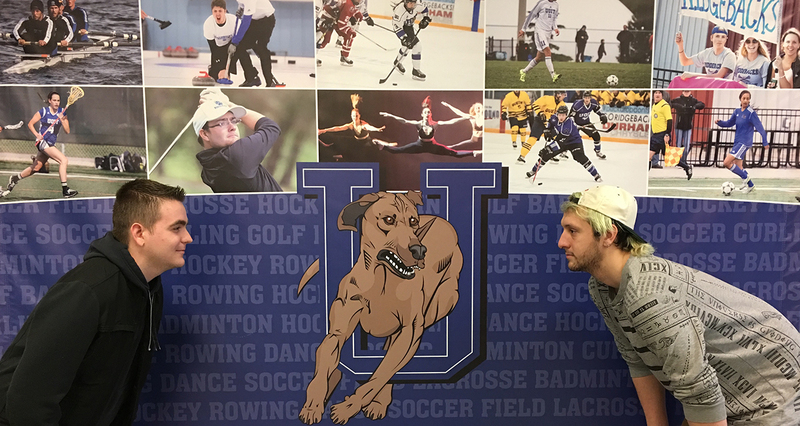 Mike Robinson, a current student at UOIT playing for the Ridgebacks and also former OHL player for the Niagara IceDogs, has had to balance his school, hockey and mental health. Robinson says playing in the OHL is a lot different than the OUAA because there is the need to balance school work on top of the hockey season, especially to maintain the marks needed for a scholarship. 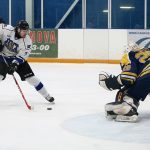 LOGAN: After evaluating the benefits of pursing an NHL dream, it becomes evident that although having the skill to make it to the NHL is critical, having strong mental and physical abilities is just as important. Although the chances of making it all the way to the NHL are low, that doesn’t mean you should give up on your potential dream may it be in hockey or not. ALEX: There are upsides to becoming a professional hockey player, but the odds are not in your favour. Getting to a level where hockey becomes a career requires years of fighting against the odds to advance to the highest level. The prospects need to balance a player’s mental and physical health. Players need to keep their options open and always have a back-up plan for the inevitable cut. 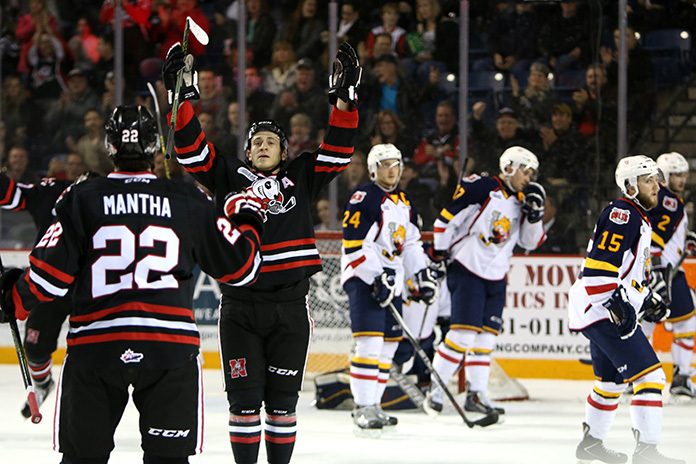 Former Niagara IceDogs forward Dan Maletta scores a goal aganist the Barrie Colts. 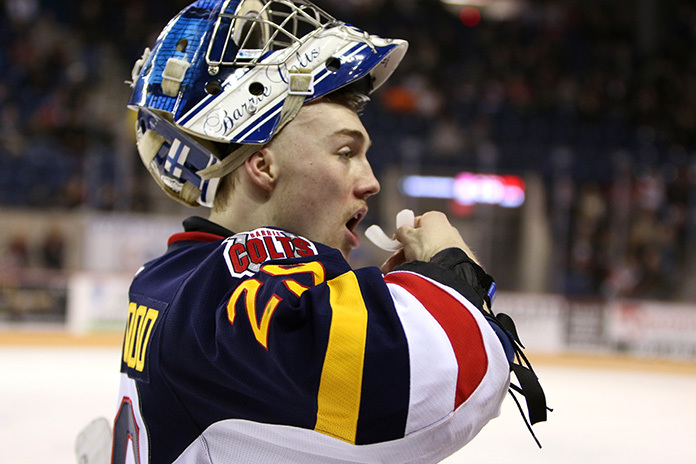 New Jersey Devils prospect Mackenzie Blackwood prepares for a game. 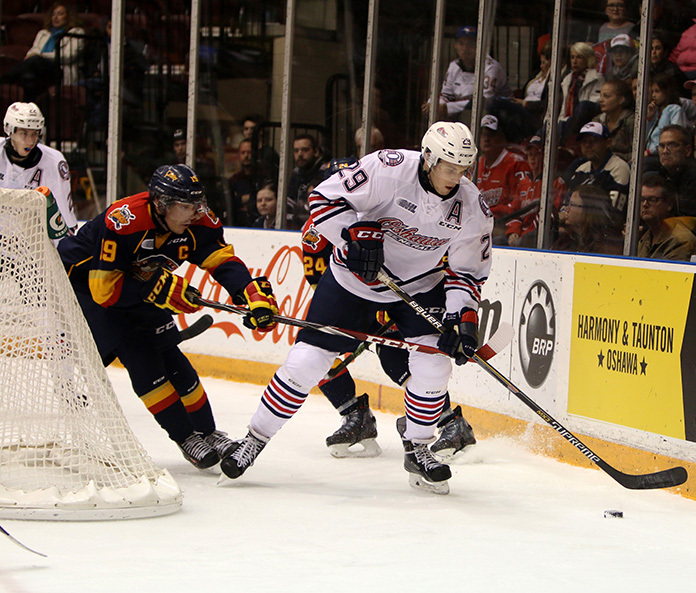 Oshawa Generals forward Joe Manchurek cycles the puck behind the net aganist the Erie Otters. 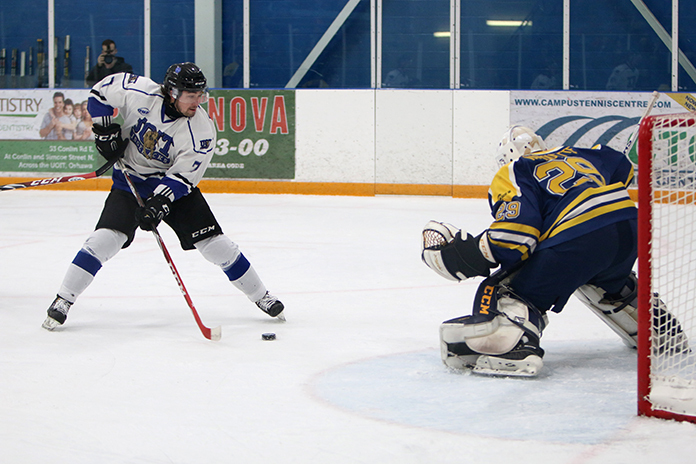 UOIT player Ryan Doucette makes some moves on a breakway. 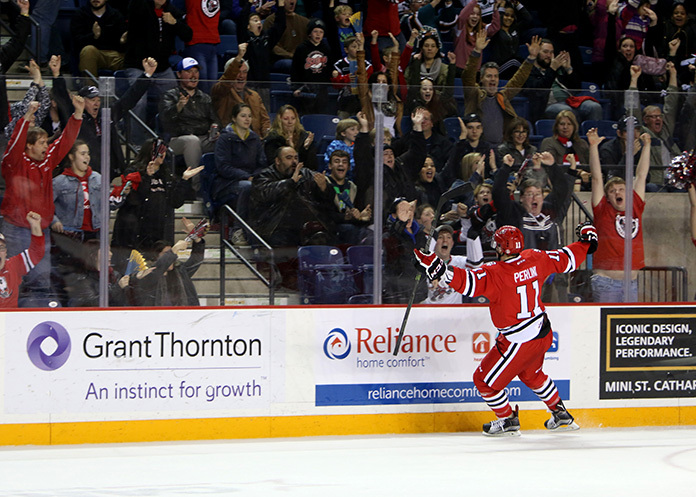 Arizona Coyotes prospect Brendan Perlini celebrates with the crowd after scoring a goal. 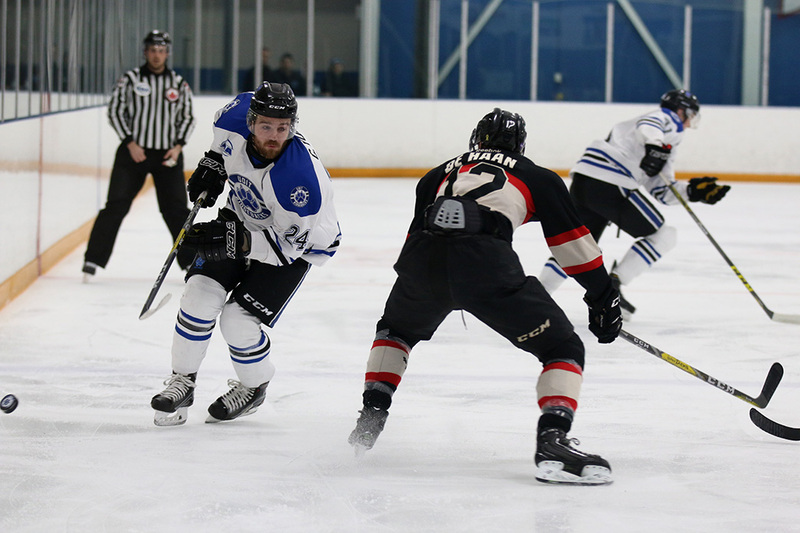 UOIT player Cameron Yuill dumps the puck aganist the Carleton Ravens.